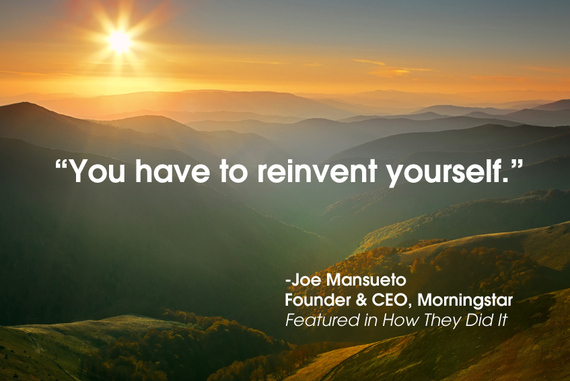 Morningstar founder and CEO Joe Mansueto had lots to say when I asked him how he started a modest financial directory in his apartment and grew it to 3,800 employees around the world with $700 million annual revenue. 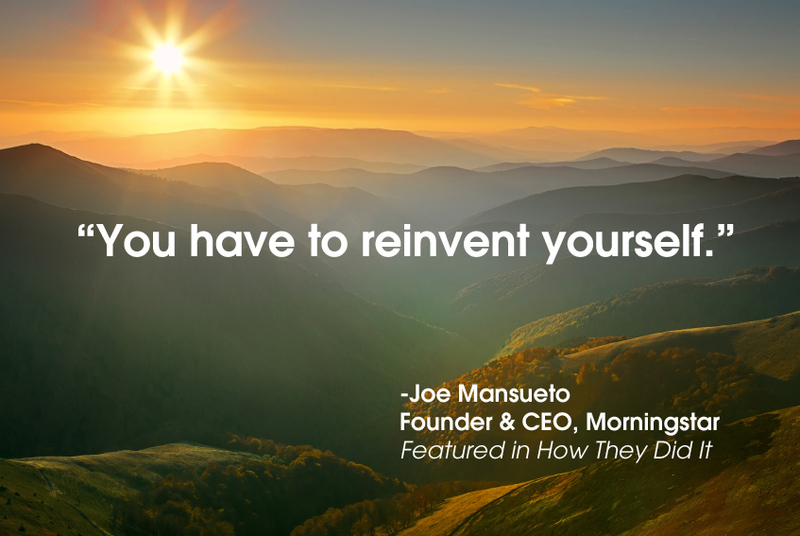 In my How They Did It interview with Joe, he said it was only by acts of reinvention that he could grow, and that Morningstar could grow to what it is today, the premier provider of financial information in many markets. Many of us feel like we are stuck on a path we can't change. Maybe it's the time already invested or fear that making a change could actually be a worse mistake. But the majority of successful entrepreneurs and professionals make a leap into uncharted territory. You may not be setting out to create the next Morningstar, but if you're a professional and need to pivot, shift, or jumpstart your career - what do you do? How do you reinvent yourself? 1. Pay Attention as Your Sense of Purpose Evolves. Scott Keffer took a turn in his career to launch a financial advisor bootcamp. Prior to this, Scott was very successful as a financial advisor with many clients - until he got the itch to make a bigger impact. He looked at how he could bring his expertise to his competitors...yes, competitors. He envisioned talking in front of hundreds of colleagues instead of advising clients one on one. Slowly but surely his own definition of his best and highest purpose was changing and expanding. As Scott told me, "I can impact fifty clients' lives - but through other advisors, I can impact fifty thousand lives." 2. Observe Your Passions. Scott says he noticed that when he talked about how to help others, his passion re-doubled, or as he said, he had a moment of affirmation. 3. Stretch! Jim Camp is an expert negotiation coach, having coached big names like TJ Rogers, CEO of Cypress Semiconductor, and even the FBI in hostage situations. After flying a fighter jet in the US Air Force, Jim continued his love of flying, becoming a commercial pilot. He started to think about what he had learned from flying and realized that systems, protocols and processes that had been drilled into him had kept him alive. He decided that those same kinds of systems could help in everyday life. He put this theory into practice, coaching a business friend in a negotiation. Casual help turned into formal clients, while Jim continued to develop a decision-based negotiations system, stretching himself along the way. He reinvented himself in amazing ways. Jim wasn't a great writer, but he wrote a best-selling book, Start With No, now translated into many languages and sold worldwide. He didn't understand computer technology, but created an online negotiation system for sales professionals. 4. Look for Solutions in Your Problems. Scott says "the frustrations I encountered as an advisor, which I solved through coaching, training and creating systems and processes, have been the source of our innovation. If it was a problem and frustration for me, it must be for others as well. Focusing on our ideal clients and their biggest frustrations and problems is our prime source for new offerings." 5. Keep Learning. Joe Mansueto was a great student of success, reading biographies of successful leaders and intensely analyzing how great success was achieved. He specifically said learning was his way to avoid failing and that he would rather learn from someone else's mistakes and get it right the first time. 6. Follow Your Mission and Purpose. Scott says "there are always moments of commitment...points of no return." For Scott, he had to take a leap and wind down his financial practice. Jim quit his job as a pilot to start a career in negotiation coaching. Joe quit his job as an analyst to launch Morningstar. These are make or break moments fueled by a burning desire to achieve your mission and purpose. Burning desire doesn't always lead to instant success. "Flops are almost always from cutting corners, from falling short on fundamentals," Jim says. "You only learn from failing and so when you do fail, you have to go back and start over." 7. Stay on Track. Your commitment will be tested. And re-tested. When Scott decided to start coaching other financial advisors, his income from his legacy business declined, but new income did not catch up right away. He had to keep at it to see the fruits of his labor. The lesson I learned time and again from interviewing champion company founders is that invariably the first effort, product or strategy fails. It's a bust. What do you do then? In tech circles everyone uses the word pivot, meaning to find your Plan B. For Scott he had to double down, meaning coming up with new ideas like live Boot Camps for financial planners as a way to generate income. Ultimately Scott succeeded - his "Double You Affluent Clients" program and live seminars are known to thousands of financial advisors across the US. Throughout it all, Scott says he had to keep reaffirming his own vision weekly and even daily. In Jim's case he realized "the world was mine. I just had to take it. I had an opportunity. I woke up one morning, and had to focus all my attention on a new direction. At that point making the jump was easy. I had such a powerful mission and purpose and surrounded myself with great people, and if I failed, I would learn and go back at it."